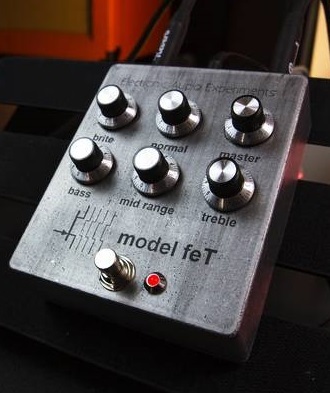 The Model feT is a transistor-based pre-amp pedal designed around the legendary Sunn Model T amplifier. Those who have played the original know that while it excels at heavy tones when pushed, it is far more just an amp for stoner rock and doom metal. In fact, on its own it is a rather clean amplifier with a tone that is dark, yet clear and present. Most famous Model T tones come from putting a distortion or fuzz in front of the amp. Thus, the Model feT is designed to sound good on its own and with other pedals stacked into it. This pedal goes beyond the standard triode-to-JFET conversion to deliver massive headroom and volume output, in the true spirit of the amp which inspired it. Controls include independent gain controls for the Normal and Brite channels, a 3-band EQ with the same voicing as the original, and a master volume. The Model feT can be used in front of an amp or straight into a power amp, depending on user preference.